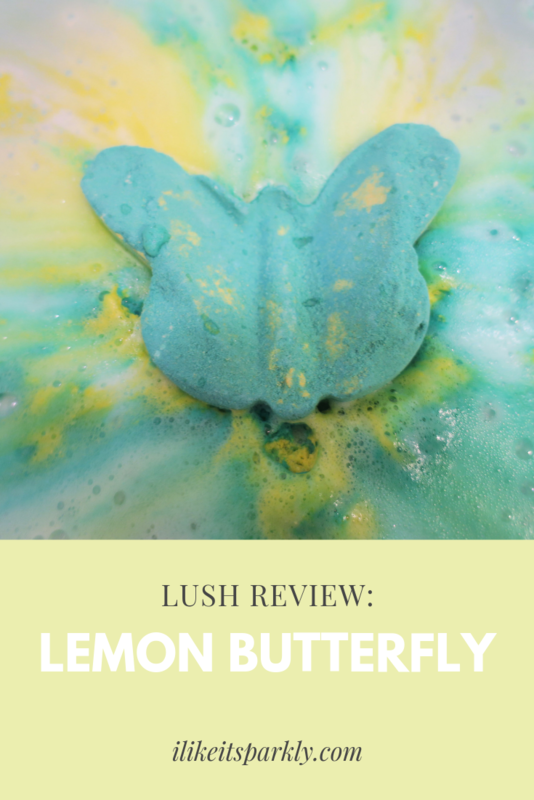 Today I will be talking about the Lemon Butterfly bath bomb from Lush, as you probably know. This bath bomb will run you $5.25 and that is pretty reasonable if you ask me, especially for a Lush product. This product features ingredients such as Sicilian lemon oil, sweet orange wild orange oil and that is basically it for things that stick out as scented products for this one, so this sounds great already if you ask me. I love the appearance of this bath bomb, I think it is really cute and really interesting, it’s a different shape for sure and I like that while it is different I don’t feel that it has a tendency to break a lot, granted I have limited experience with this one as I have only purchased two of these but neither one came broken so I think that says something. Anyway, I like the marble look of it and I think it is really pretty, I love the colors of this one too because it’s a really bright and fun springy color palette. 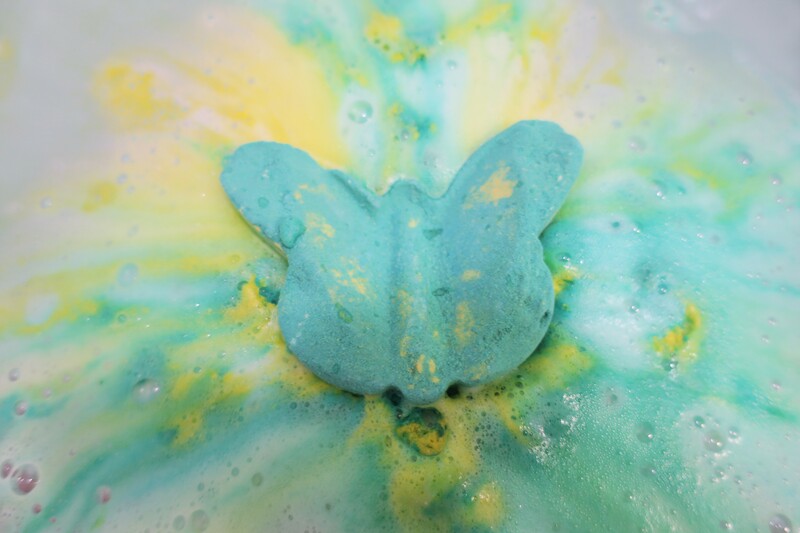 This hits the water and fizzes out into exactly the colors you would think, various shades of teal, yellow and white. It swirls together beautifully and it leaves the water looking a really pretty teal shade that I just love the look of, as you will see below. Now, let’s talk about the scent of this, I love the scent of this so much that I’m going to need to pick up another one or six of these before they go away. This scent is citrusy, as you may have guessed by the featured products above, and I am into that because those are my favorite scents. This scent is very bright and a little bit sweet, along with just being lemony with a touch of orange to it, it’s good and I really like it. 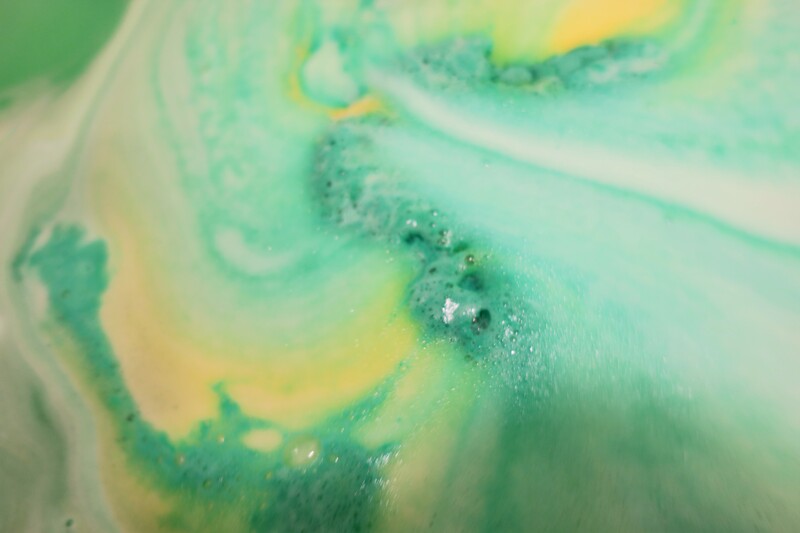 The scent really lasted throughout the bath and did linger on my skin, which I really love because not all bath bombs are that potent. This feels great in the water and on my skin, as all Lush bath bombs do. This didn’t feel particularly moisturizing or anything like that, but it did leave my skin feeling soft and it felt great in the water so I am still really happy with this bomb. I think you already know how I feel but I loved this bath bomb, it was such a bright and uplifting scent. I think this would be perfect for a morning bath, which I rarely do, but also great in the evening as it is still relaxing if you ask me. Sidenote, have you guys heard about all of the bath bombs Lush is releasing on the 29th? They are releasing 54 brand new bath bombs and I am excited but scared for my wallet, so get ready to see all kinds of Lush bath bomb reviews in the near future. What is your favorite Lush bath bomb?